Self-awareness- The ability to recognize what you are thinking, feeling and needing. Self-management - The ability to translate your awareness into action which takes care of your needs. Social awareness- The ability to take others' perspectives and empathize with them. Relationship skills- The ability to establish and maintain healthy relationships. Responsible decision making- The ability to make healthy choices for yourself and others. If you started implementing SEL years ago, you likely had a crystal ball somewhere hidden in your desk drawer- perhaps right behind your supply of notebooks and #2 pencils. Clearly, you could predict the future. Many would argue that SEL, which involves skills which are universally powerful across time and place, is particularly timely now. 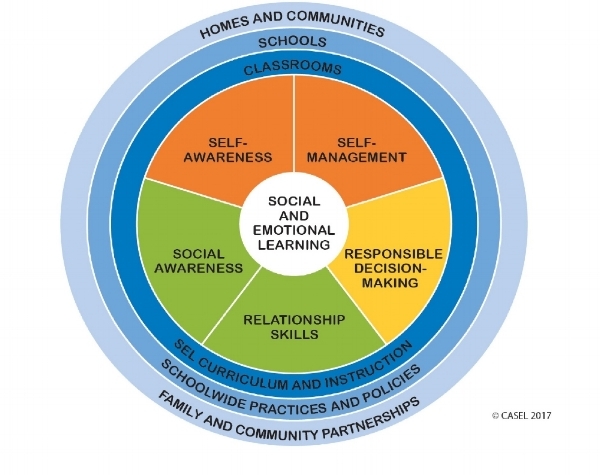 SEL offers educators a framework for actively making the connection between academic learning, behavior, social relationships and emotional needs. Such a framework is particularly useful nowadays, as instances of suicide, depression, anxiety and school violence are on the rise, because it can leave educators better positioned to proactively support student's holistic needs. Instead of needing to react to problems, educators are helping empower students to cultivate healthier habits from the onset. What information and skills do we need students to learn? How can we deliver content so that students are able to retain information and skills for the test and advance to the next grade? What are holistic needs and how can we empower ALL learners to develop awareness and healthy habits around those needs? How can we cultivate environments empowering students to self-regulate their emotions, think critically, interact positively with others and advance their personal growth to promote further success, academically and beyond? These new questions might sound complicated at first. In practice, they can actually make our jobs as educators easier since students and adults have had social and emotional needs (like needing respect, dignity, safety, self-care, etc) all along. The difference is we are widening our lens to see, understand and take action accordingly. Questions are thus shifting to embrace the idea that learners are MULTIFACETED and HOLISTIC beings requiring multifaceted, dynamic holistic approaches to learning. Learning involves an interplay between our connections with others (the "social" part) and how we feel (the "emotional" part) of social and emotional learning. If you are an educational leader looking for a high-leverage approach to create a lasting, postive impact on your school's culture and climate, these questions can serve as a filter to help you and your teachers decide where to direct your limited time and resources. This brings us to the two "secrets" of social and emotional learning. SET = Social and Emotional TEACHING. Social and Emotional teaching, which is a term I began using while working with and learning from hundreds of talented schools nationally, was born out of the idea that a teacher's capacity to access and use the five key competencies of SEL for her or himself are vitally important. Therefore, social and emotional teaching is the idea that an educators capacity to cultivate the five core SEL competencies as teachers (self-awareness, social awareness, self-management, relationship skills, responsible decisions making) is vital, and often a prerequisite and precurser, to creating a culture and climate conducive for social and emotional learning involving students. What you model, your students watch. What your students watch plants seeds which (eventually, and with cultivation) grow. Cultivating social and emotional teacher skills helps put YOU, as a talented, dynamic educator with important needs, in a position to arrive with calm, clarity and a collaborative orientation. 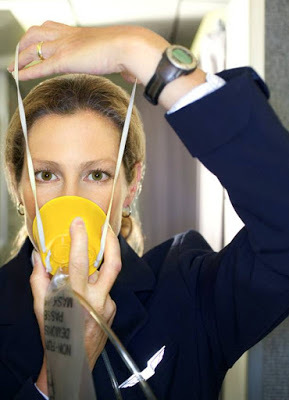 To use the airplane analogy, adults seated next to children are asked to place their oxygen mask on first before assisting children with theirs. Just as we wouldn't expect a math teacher to teach her subject without thorough professional development regarding teaching strategies and a thorough understating of the math content, it would not make sense to send a teacher into class to teach SEL without understanding and practicing SEL concepts herself. For this reason, quality SEL professional development is key. Some might say that SET, social and emotional teaching, is implied with SEL, social and emotional learning since we are all learners. However, as educators with long lists of checklist items to complete, it can become easy to put our needs last. SET reminds us of the power of focusing our attention on our own needs as a propellant for increased effectiveness with students. As an educator, you are likely a talented "giver". In other words, you are likely accustomed to focusing your attention on your students' needs, helping others and, only after you've supported others, looking to meet your own needs. Your propensity and desire to help your students is both honorable and amazing! That said, you deserve to feel calm, stable and happy too. Plus, interestingly, students will sense and eventually, to some extent, begin to mirror the manner in which you approach class. If you are frantic, they will be more likely to follow suit. Importantly, if you are calm, they are likely to calm. Your ability to be self-aware of your needs, one of the core SEL competencies, is the first step towards finding ways to actually meet your needs. Maybe that means you taking a moment to calm yourself before interacting with an agitated student, for example. There is no such thing as learning that doesn't involve social and emotional components. Human learning is, by definition, a function of our thoughts (cognitions), feelings (emotions) and propensity to apply this learning (social) through interaction with the world. Therefore, academic "content cannot be compartmentalized and "poured" into our students since our students are dynamic learners- not containers. The upshot of this secret is that you can feel confident that your decision to invest time into activities which foster social and emotional growth is high leverage and wise. So, now that we know the two secrets of SEL, how can we grow and create empowering opportunities for students? Below are two simple practices you can try and build upon- one which relates to each secret of SEL. This practices relates to the first secret of SEL: As an educator, you must SET yourself up for SEL success. In practical terms, for example, you can start each class by taking a few deep breaths. For yourself. Just for you. A gift of calm. At some point, you may invite your students to join you in taking calming, centering deep breaths as needed throughout class. Jon Kabbat-Zinn, commonly regarded as the father of Mindfulness, defines mindfulness as "paying attention in a particular way: on purpose, in the present moment, and nonjudgmentally". Being present, fully attentive to what is happening with curiosity, can help you, as a talented educator, develop two of the core competencies of SEL and SET: self awareness (we begin to feel what is really happening and get in touch with thoughts and emotions) and social awareness (we begin to develop awareness of others without a filter of what they "should" be saying or doing). Mindfulness can later pave the way for our own self-management and care in the face of stressors as well as calm which leads positive relationships and responsible decision making. Put in another way, practicing mindfulness can help make all 5 SEL competencies more accessible for us as educators. You and your colleagues have already worked tirelessly to create powerful lesson plans. You might as well leverage that hard work to benefit your students by looking for SEL connections within what you have already created and discussing these connections with students. Integration does not mean working harder. It means working smarter in a streamlined fashion. Therefore you are invited to look at your current lesson plans and highlight areas that relate to social and emotional learning. You are encouraged to think about ways you can draw out and accentuate the power of SEL in your lessons. You may want to discuss the connections between your academic content and SEL with colleagues too and then carry those discussion into your classroom discussions with students. For example, your class may be reading a novel featuring a character with high self awareness which helps her manage her emotions in a difficult time and go on to make responsible decisions when interacting with others. The beauty of this step is that you have ALREADY done 99% of the great work of creating a powerful lesson. Now all you are doing is explicitly making the connection to SEL. To help further propel your success, this resource offers 21 Simple Ways Teachers Can Integrate SEL into Teaching. Reach out to my team and I here to learn more secrets and create systems and practices to support your SEL success for ALL staff and students. With so many important areas and initiatives that you are orchestrating within your school, we can help you streamline, integrate and leverage social and emotional learning to improve outcomes related to academics, wellness and behavior. Congratulations on your continued growth and please share the two secrets of SEL with others to further the movement of which you are a vital part!